United Airlines will no longer ask law enforcement to remove passengers from its planes when it has to bump them, the company’s CEO has said. He also hopes to create a new incentive system to coax customers to opt off overbooked flights. "We're not going to put a law enforcement official... to remove a booked, paid, seated passenger," United Continental Holdings Inc CEO Oscar Munoz told ABC News on Wednesday morning. "We can't do that." The promise comes three days after video of aviation police forcibly removing a seated passenger from a flight went viral. United needed four seats on flight 3411 from O’Hare International Airport in Chicago, Illinois to Louisville, Kentucky for the flight crew of a regional partner, lest they delay several flights the next day. No one volunteered to leave the flight, so employees offered up to $800 and a hotel stay as compensation. There will still no takers, so the airline staff used a computer to randomly select passengers to remove. When Dr. David Dao was informed that he would have to leave the flight, he refused. The flight crew then called for airport police to remove him. Footage shot by other passengers showed Dao screaming and struggling as aviation officers removed him from his seat and pulled him down the aisle of the aircraft. Later videos showed him back on board the aircraft with a bloodied face and appearing disoriented. "It was a system failure," Munoz said. "We have not provided our frontline supervisors and managers and individuals with the proper procedures that would allow them to use their common sense." "They all have an incredible amount of common sense, and this issue could have been solved by that," he added. "This is on me. I have to fix that, and I think that's something we can do." United needs a new incentive program to bump passengers who are already seated, rather than using police, the embattled CEO said. Some on social media reacted with skepticism to Munoz’s pronouncement. @richardquest you say United's Munoz showed leadership in his interview with CNN? BS. Never said how they would address without Police help. Others suggested the company use police to oust Munoz from his position as CEO. In the same interview, he said he would not step down. @CNN Hey @united OSCAR MUNOZ, another kind gesture? Resign in disgrace and apologize to police for asking them to commit criminal assault. A total of three officers with the Chicago Department of Aviation have been placed on administrative leave, WLS reported Wednesday. One officer was immediately placed on leave a day after the incident, and the names of the officers have not been released. The 300 officers on the Aviation Department’s certified police force do not carry weapons (nor have they ever done so), but they have been asking to be armed since the force’s founding 30 years ago, according to the Chicago Sun Times. The officers receive more training and pay than private security guards, but not as much as members of the Chicago Police Department. The City of Chicago has repeatedly declined requests to arm officers at O’Hare and Chicago Midway Airport, arguing that more people carrying guns would make the airports less secure not more, the Sun Times’ Mark Brown wrote in an Op-Ed. While not involved in the incident with Dao at O’Hare, the Chicago PD has also been criticized for how it reacted. A member of the department’s press team issued an unofficial statement on Sunday night that summarized what happened in a way that was inconsistent with the video of the incident. The Chicago PD will also be updated its guidelines in response, according to chief spokesman Anthony Guglielmi. "A takeaway for me is to ensure the department's press office is more consistent in referring to appropriate outside agencies for incidents in which CPD is not the acting or involved agency," he told the Chicago Tribune’s Eric Zorn. 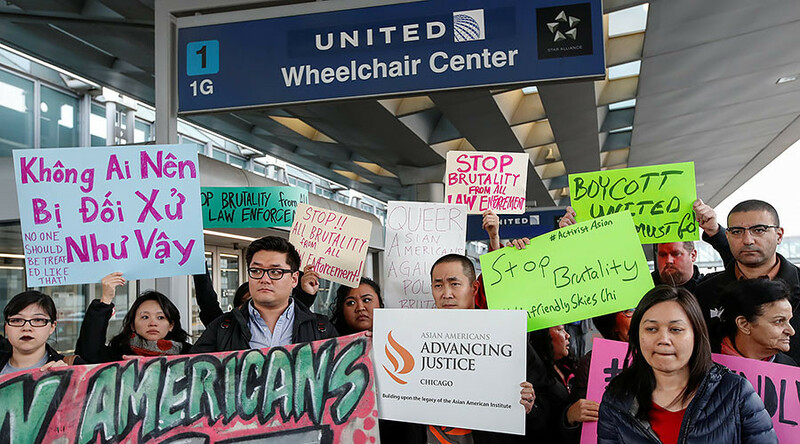 The backlash from the incident has cost United Continental far more than the $2,400 total it offered to the passengers forced off flight 3411. Shares in the company had fallen as much as 4.4 percent on Tuesday ‒ plummeting more than $800 million ‒ but shares were up 1.1 percent in premarket trading on Wednesday morning, CBS News reported.